Clear, transparent glazes are used as a finishing coat over underglaze decorations. Follow directions carefully with respect to firing and application. Cone 05. 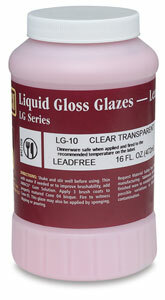 This clear, transparent glaze is used for application on decorated greenware or bisque. LG-10 will not discolor the underglaze or cause colors to bleed. Cone 05.